Comics&Cola: The beautiful, starry adventures of Astro Dog! 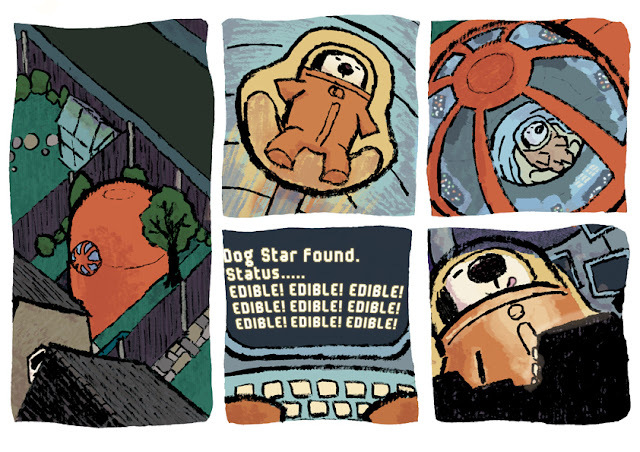 I’ve been meaning to flag up Paul Harrison-Davies‘ new web-comic, Astro Dog since its launch on June 28th. I know of Paul’s work from his contributions to great British comic anthologies ink + Paper and Solipsistic Pop, and his unqiuely coloured artwork is really, quite simply, lovely, and recognisable off the bat. Astro Dog, a beautiful silent comic that updates Monday, Wednesday and Fridays, is carried by the charm and character in those illustrations. It’s set a little apart from other web-comics not only in terms of the style, but by it’s lack of dialogue and child friendliness. Can you tell us what AstroDog is about? Astrodog is about a little dog (maybe a Jack Russell?) that has space adventures. She lives in a house that has more than a passing resemblance to my own, but I don’t think my dog has a space suit. It is, hopefully, just a fun yarn that I hope gets a bit sillier as it goes. Being silly in real life is easy, writing silly is really hard! Did you envision AstroDog as a web-comic or did something in particular encourage you to go the web-comic route? 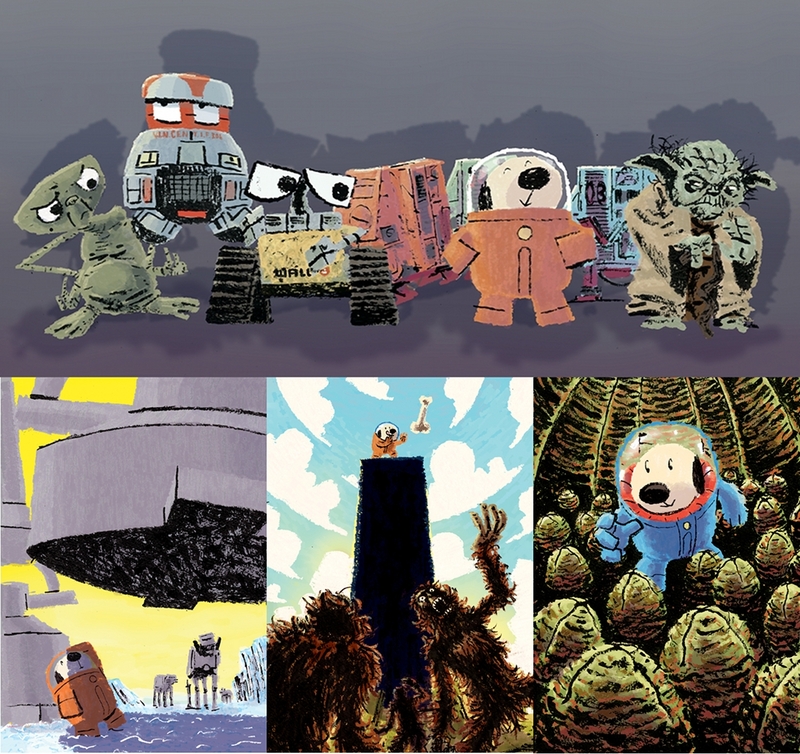 I first had the idea of Astrodog quite a while back as a picture book. 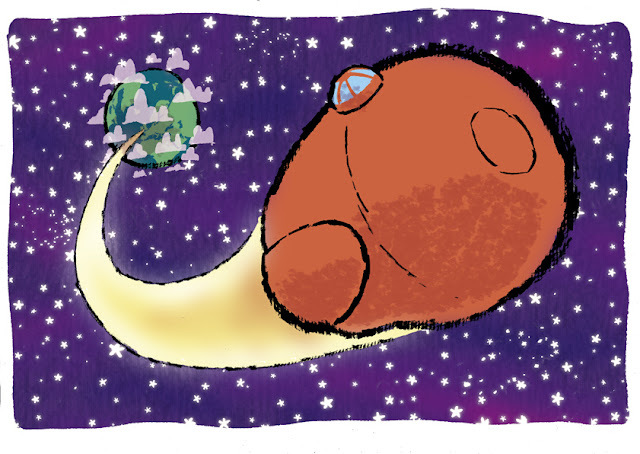 Later I was asked to pitch to a brilliant children’s comic called The DFC and they decided on Astrodog. Unfortunately The DFC folded before Astrodog was able to appear. Another publisher showed an interest in Astrodog but nothing came of it and I lost heart a little. After a while I kept thinking back to Astro and decided I should just finish it for myself and not worry about publishers. Initially I had no idea what to do with it, but an article about using webcomics as a way to drum up interest in a Kickstarter fund made me think I might as well start posting it online. Online comics are great, and I wasn’t resistant (as the landscape format show, but that was also a call back to Astro’s picture book days, and at one point was going to be a half page strip in The DFC), but I did wonder if the pacing of Astrodog was suited to the format – being designed as a one pager in a weekly anthology. I did mess with the pacing quite a bit from it’s original DFC version, but it was still told a certain way in my head. Is all the artwork and colouring digitally produced? The line work is ink and brush on watercolour paper (for added texture) and coloured digitally. 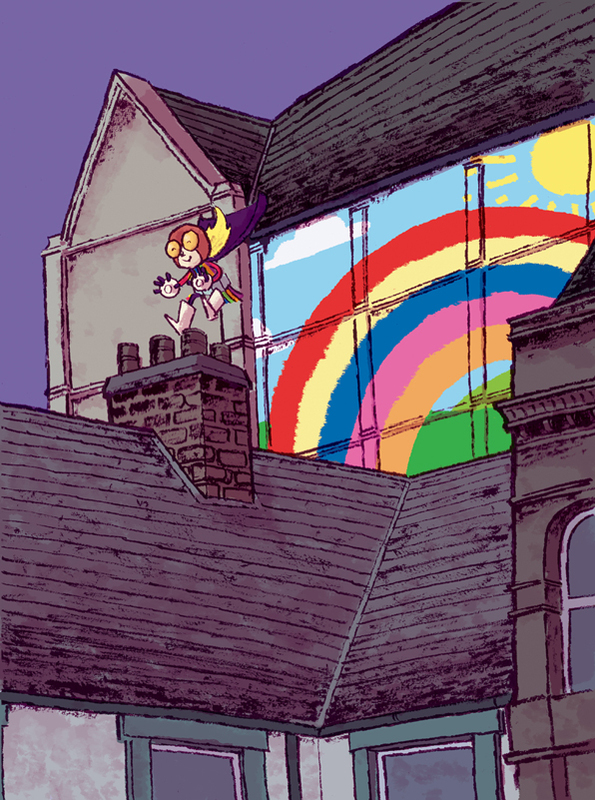 I experimented earlier with drawing blocks of colour with a brush pen instead of linework and altering those colours digitally and this technique found it’s way into Astrodog which is where some of the slight texturing comes in (you can find more detail on Paul’s process here). Astro-Dog is very child friendly- do you think there’s much of a children’s audience for online comics? Thank you, child friendly was the aim. I’ve done a few text free comics and the idea for Astrodog was that children struggling to read would be able to enjoy it. Since I started Astrodog I’ve changed my mind a little in this regard (probably because I’m studying to become a primary school teacher) and plan to use more text, but to be careful and make sure it’s compatable with Systematic Synthetic Phonics, which is how many children are taught to read. I’m not sure what the online audience is like, I’ve very new to this side of comics and making it up as I go! Ideally I’d like to say reaching all ages online, especially with tablets, is a great idea, but it all depends on whether children have access to the internet, or tablets. There’s also the problem of how do people find the comic – obviously that’s easier for bigger names, but no so easy for me. I really do hope there’s a children’s audience out there, and that they find Astrodog. Too soon to ask maybe(!) but do you have plan for AstroDog and his story, or will you see how and where it goes? Well, the first Astrodog story is going to be about 32 pages long, and at the moment I’ve drawn up to page 27, so I know where this story is going. I’m unsure if there’ll be more Astrodog stories, it depends if I come up with something suitably silly. Once Astrodog is finished I have a short story to do for a children’s anthology of horror comics, called Boo!, that I’m putting together with some friends. After that I hope to start a new webcomic called Paint Girl, which I’ve been wanting to ever since my daughter came up with the character.